Someone asked me: "I just got a new Weber, I'm totally new to BBQ, what do I do?" and I see this occasionally in the Adventures With A Weber BBQ thread. I started writing a few notes down for them, then I thought I'd just write something a little bigger that other people can refer to as well. Maybe it can get stickied. If you have a question I recommend heading over to the Adventures With A Weber BBQ thread as that sees alot of traffic. First off, and possibly most importantly, I would say: Don't be put off by a bad experience! I guarantee you that EVERYONE who has posted a picture of something awesome in the BBQ thread has had some epic fails along the way (I know I sure have) although only one person has been man enough to show it. Be sure to have some boxed pizzas in the freezer should things turn pear shaped and be willing to just laugh and chalk it up as a learning experience if something goes horribly wrong. 1) First fire it up and cook come cheap steaks. Steaks over coals and delicious. Thicker steaks are best. 2) Grab some cheap sausages (though not those 'precooked' ones) and do them at the same time as the steak. But first bake the sausages 'indirectly' at a high heat (lid on) with some smoking wood chips on the coals. Then quickly finish them over the coals (lid off) to get some sweet grill marks on them. Sausages this way are awesome! 3) Do a 'Hot Smoked Chicken'! These are forgiving and can take quite a bit of abuse. Setup the BBQ for indirect cooking, use a water pan. Light the coals, put the bird on, put the temperature probes in, chuck a hand full of smoking wood chips or chunks directly on the charcoals (do this as close as possible to closing the lid), then close the lid and crack a beer! Keep an eye on the temperature of the chicken and take it out when the thickest part has reached a safe temperature. Add more smoking wood chips at any point if you like. Some people like things heavily smoked, some like lightly smoked. You will soon figure out what's best for you. The chicken may take an hour or even up to two depending on how hot it is in there (aim for 180°-250°C range). Top and bottom vents can probably stay fully open for this cook. 4) Maybe roast lamb/beef if you are keen on such stuff? 5) Pulled pork ('slow and low' pork shoulder roast) is the easiest 'slow and low' cook. 6) Ribs/Brisket/Turdukin? ... you're a BBQ pro by now! - Weber Kettle BBQ ... That is why you are reading this after all! 18.5" or 22.5"
- Thermometers are almost as important as the BBQ itself (dual/multi- probe is best). Most people seem to be happy with the 'Maverick' brand ones. - A charcoal chimney starter is also key. You don't NEED one but you will soon realise that yeah, you do need one! The Weber brand one is best but the el cheapo ones work just as well (but tend to fall apart after 2 - 3 years). - Some sort of crappy steel tongs are good to move rouge charcoal around. - Never close the top vent completely (unless you are shutting off the BBQ and want to extinguish the charcoal). Even if you are trying to keep the temperature really low you want the top vent at least halfway open. This is to prevent the build-up of bad chemicals and flavours on the food. Usually you can leave the top vent fully open and not worry about it at all. - Use the bottom vent to control temperature. Fully open is full temp obviously. It takes a while to get the hang of it but when I'm doing a low temp and shooting for about 100°C oven temp I have the bottom vent about a quarter open. - Never put a thermometer probe or wire directly over the charcoals, it WILL fry it! - To measure the oven temp poke one of the probes right through a potato cut in half... far enough through so the probe is well out the other side. Now sit this potato on the grilling grate. - Never use 'Coal'! Always use 'charcoal'. There is a difference and some people do get confused. - "Charcoal Briquettes" will generally give you a slightly lower heat but will last longer, and the heat will be more stable. "Lump wood charcoal" will burn hotter, but you will go through it quicker. Some people say lump wood charcoal makes your food taste better. - You can reuse charcoal! when you are done cooking immediately close the top and bottom vents completely and put the lid on. Within a few hours the charcoal will be extinguished (I usually leave it overnight to let it cool as well). Shake the charcoal around a bit to remove the loose outer bits and then save what is left for your next cook! - If you are doing a hot cook (chicken, steak etc.) use more charcoal than you think you might need. Dump a chimney load of lit coals on there and add a few more unlit ones. Remember you can extinguish them once finished cooking and re-use them. Running out of heat before the food is cooked is disappointing and frustrating. - NEVER use the 'self lighting' briquettes, they will leave your food tasting like fuel. Alot of people here seem to use 'Heat Bead' Brand 'Charcoal Briquettes' available from Mitre10 or sometimes countdown. They come in a RED bag. The ones in the yellow bag are the self lighting ones and are not good. - It is fine to use fire lighters though. - When hot smoking use the biggest wood chips or chunks as possible, you will get a longer, steadier smoke. - 'Indirect cooking' is when you cook with the lid on but not directly over the coals (i.e. a roast chicken). To do this bank all the charcoals up on one side of the BBQ and put the food on the upper grill on the OTHER side of the BBQ, as far away from the charcoal as possible. The best demonstration on how to setup your BBQ and cook a chicken using the indirect method is shown here. - 'Direct cooking' is cooking directly over the coals (steaks). It is good to only spread the charcoal over half the bottom grate so if some steaks are getting burnt you can move them to the other side away from the direct heat. - If roasting a chicken or doing a long slow cook you will want a water pan. (some kind of steel or disposable aluminium pan) Fill the pan with boiling water from the kettle after you have put it where it needs to be (opposite the charcoal, under the meat). - I only use rubs for loooooong slow cooks / smokes. If you are just doing chicken at high heat use whatever you might use if roasting it in the oven, and if you are still not sure then salt + pepper + a good slathering of butter is plenty good enough! - It should go without saying that you should take food safety seriously! Also that I take no responsibility for your food safety. - Having a digital thermometer not only guarantees good results on a charcoal BBQ but it can also guarantee food safety. If you haven't got one by now, go get one. Seriously. - Adding wood smoke to your cooks can add a pink smoke ring to meats (usually near the outside but it can penetrate a few centimeters) this is caused by "myoglobin in the meat reacting with nitric oxide to form the heat stable pigment nitrosohemochrome". So your hot smoked chicken or pork may be well cooked but still be pink on the inside! This is a good thing. Again, that thermometer will tell you when the meat is cooked, not the color of the meat itself. - Minion Method shown on a Weber Smokey Mountain ... but also works on a Kettle. - Roast Chicken & Veg This is the best place to start if you just got your BBQ and want to cook a chook! - AmazingRibs.com and absolute gold mine of information! Can be overwhelming at times. Recipes, techniques, and reviews. American bassed so some conversions required. - TheSmokeHouse.co.nz A good place to buy large wood chunks, spice rubs, BBQ accessories and more. Last edited by Merkinz; 31st July 2014 at 6:35 pm. Absolutely! If you are using a Weber or similar BBQ shut all the vents as soon as your food has finished cooking. This extinguishes the fire relatively quickly however be sure to to wait a few hours before opening the BBQ again just to make sure they don't re-light. Once the coals have cooled shake them around on the grate a bit to loosen the dust and spent outer parts of the coal, recover whats left and use it next time. Should I soak my smoking wood chips before use? "Never, ever, soak your wood in water, or any other liquid for that matter. Wet wood might appear to produce more smoke, but that is really just the fog of condensing steam. In fact, wet wood smolders at a low temperature that prevents the best smoky flavors—called phenolics—from developing, and favors the creation of large volumes of acetic and formic acids. Acetic acid is the main compound in vinegar, while formic acid occurs naturally in ant venom. (Yum!) Both can make for unpleasant, sour-tasting food." I'm cooking a lump of meat 'slow and low' and the internal temperature stopped rising? This is a common phenomon known as "The Stall". Well into cooking, the temperature of uncovered meat stops rising (usually around 65°C) and may even fall slightly before it climbs again. This 'stall' is caused by moisture evaporating from the surface and cooling the meat just like sweat cools you on a hot day (aka: evaporative cooling). It has nothing to do with fat or collagen. If you wrap the meat in foil, the humidity in the foil is close to 100% but there is no evaporative cooling, so this method, called the Texas Crutch allows you to power through the stall. A more thorough treatment of this can be found here. Does 'Lump Charcoal' make the food taste better than 'Briquettes'? Does this mean one type of charcoal is better than the other? No not at all! For a more thorough discussion on the minor differences between Briquettes & Lump charcoal check out this writeup here. The best advice is to try out both and use which ever suits your cooking style. Some people prefer briquettes for their steady and predictable temperatures, others use lump charcoal for their fast lighting and higher temperatures. Some people will even use one or the other depending on what they are cooking. Last edited by Merkinz; 29th October 2014 at 1:48 pm. Most BBQ sites will tell you which cuts to use for what, most of these cuts have different names to the ones you find in New Zealand. Below is a visual guide (the best I've seen) to the American cuts of pork. This comes from the cookbook: "MEAT: Everything You Need to Know" By Pat LaFrieda. Last edited by Merkinz; 3rd November 2014 at 2:12 pm. Subscribed, this is a massive endeavor. Good work. I need to get more active within the thread sharing more of my creations! Well you have some awesome looking resuts but because there were so many I was biased to the ones that showed the process from start to finish as I imagine that is what someone might be wondering when they click on a link. good work merkinz!! Good man! Great idea Merkinz. Thanks m8. I haven't been as active on the BBQ thread over the last year or so. I have also been a bit slack on actually cooking BBQ this summer, it's been a busy time for me. But looking at all the stuff in those links again has inspired me to do more. There's the Epic BBQ Leg of Lamb thread as well which is what really started the BBQ bug for me. 2nd page has my more up to date recipe for doing it on the Weber. First attempt from following the guide, cheers Merkinz. 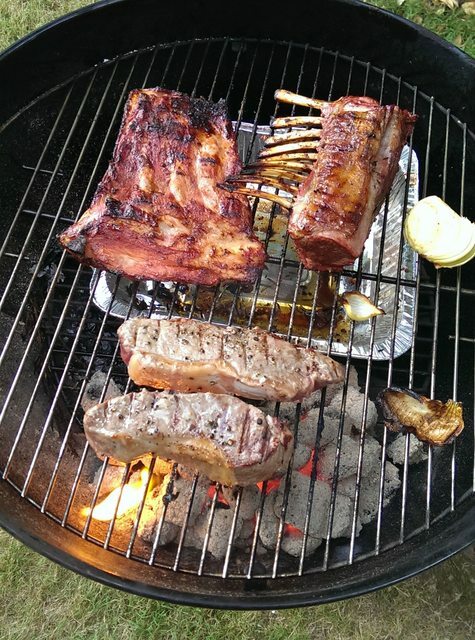 Image below and turned out really well from slow cooking the ribs and lambrack. What is the best practice to clean the set ? So far, i've just scrubbed/cleaned the grill and left the charcoal in there with top/bottom vent closed. - I can use the charcoal briquettes again yeah ? - Do i need to hose down the inner sections of the BBQ set ? I prefer it to not rust at all.. I close the vents at the end of a cook and put it away once the briquettes are extinguished (don't forget to remove/drain the water bath, that's caught me out once). Yes, you can reuse them. I usually clean the grill at the start of the next cook as the grill heats over the lit coals. Maybe once a year I'll hose down and scrub the chamber to remove soot and grease deposits - I don't think it's really necessary to do every single cook. I clean it every month or so, more regularly when I'm cooking on it often. I bought a weber wire brush from Mitre10, they do a really good job. I've used both oven cleaner and simple green spray cleaner on the grill. No preference really, although oven cleaner takes a while to act so that'd be well before my next cook. As far as cleaning out the bowl, I just hose away all the dust and ****, then pressure hose the fat deposits until everything that will shift has shifted, then I'll use a plastic scraper to remove the bulk of the remaining ****. This is my new favourite thread of all time. Adventures with Charcoal, beginning now. Oven cleaner works well but bear in mind that the active ingredient is usually sodium hydroxide. Best to keen it off the aluminium parts of the Weber. Some pictures of the different coal layouts, best methods for hot/cold smoking etc? Holy ****. I even made the list. Great thread, will be awesome to have one thread with everthing in it. I'm after a small portable Weber to be mostly used as a cold smoker. Which would be better, the smokey Joe or the go anywhere? I will eventually get a normal Weber/BGE when I get my own place. The Joe as you can mod it using a standard pot. Also the new design is now available in NZ.